Home / Policy/Trends / Another Exciting Announcement: All New Cars Zero Emission by 2050. Another exciting announcement at COP21 is the commitment to zero emission vehicles (ZEV). 13 US states and four countries signed onto the International Zero Emission Alliance (IZEA), pledging that all new passenger vehicles sold will be zero emissions by 2050. "We will strive to make all passenger vehicle sales in our jurisdictions ZEVs as fast as possible, and no later than 2050," the pledge states. Achieving this will accelerate the global transition to ZEVs and reduce transportation emissions by a billion tons a year by 2050, lowering global vehicle emissions 40%, says IZEA. It considers all-electric, plug-in hybrids and fuel cell vehicles as ZEVs. Countries are: UK, Netherlands, Norway, Germany and the province of Québec. States are: California, Connecticut, Maryland, Massachusetts, New York, Rhode Island, Vermont and Oregon. 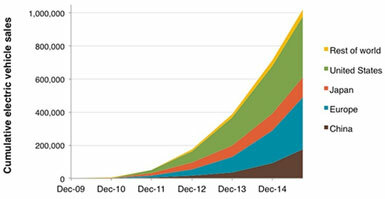 If the goal is met, 200 million ZEVs will be sold over the next 35 years in these states and countries alone. As of now, 1 million ZEVs have been sold worldwide, says HybridCars.com. Although that’s a small number, it’s helped battery costs drop 60%, opening the market more, according to the US Department of Energy. Since trashing commitments to renewable energy, the UK views this as the main way to clean up air pollution in cities, and plans to invest $906 million by 2020 to increase electric vehicle sales. This is obviously a big deal, given that twice the number of cars are expected to be on the road by 2030 – over 2 billion! 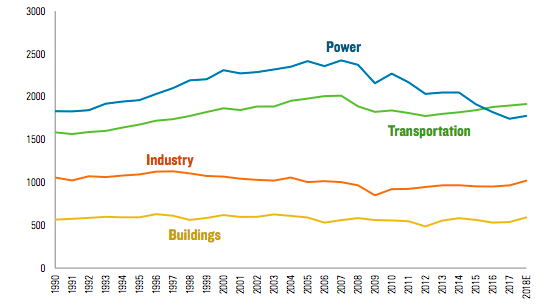 Transportation is the fastest growing contributor to climate change. It already is responsible for 25% of global emissions, with 75% coming from vehicles. This growth is propelled by the rise of a consumer class in developing countries, with hundreds of millions of of new drivers especiallly in China and India. Around 235,000 electric cars are expected to sell in China this year, says the China Association of Automobile Manufacturers, surpassing the US as the world’s largest market with 180,000 sold. Another important route to reducing emissions is scaling fuel efficiency – reducing the amount of carbon emitted per mile. In the US, we now have standards for cars and light trucks to reach an average 54.5 miles per gallon by 2025. Standards are also being raised for medium and heavy-duty trucks. China is aiming for 50.1 miles per gallon, and the European Union 60.6. Carbon intensity has already been cut 20% and can reach 50% by 2030, says Lewis Fulton at the Institute of Transportation Studies at University of California/ Davis. But without a huge increase in ZEVs on the road, fuel economy gains will be erased by the sheer number of vehicles added over the coming years. And incredibly, with gas prices so low, automakers have returned to fighting fuel economy standards in the US and EU, claiming they can’t meet them. That’s because the bulk of their sales (and promotions) are still gas guzzling SUVs and light trucks, albeit with improved fuel economy. Another way to bring down emissions is to peak peoples’ awareness. The city of North Vancouver, British Columbia voted unanimously to display mandatory climate change labels on gas pumps, as have San Francisco and Berkeley. North Vancouver’s label says, WARNING "Use of this fuel product contributes to climate change which may put up to 30% of species at a likely risk of extinction." Next Next post: Global Emissions Fall This Year, Coal Use Peaked in 2013! Correction: Quebec is not a country, it is a Canadian province.